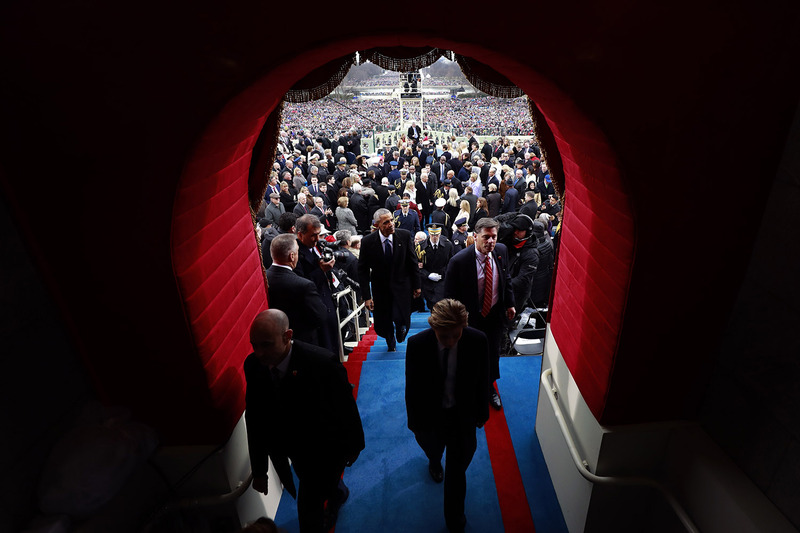 The Undefeated got up at dawn Friday to bring you a full day of live coverage of Donald Trump’s inauguration and what’s happening across D.C. Come back often to see what’s going on! 6:50 p.m. — By nightfall, the majority of people who still can’t believe Donald Trump is their president, numbering in the thousands, had moved to 12th and K streets. They burned copies of newspapers with portraits of Trump on them. They sat in semicircles and commiserated by candlelight, some singing somberly, others chanting angrily. This was no longer a protest; it was a vigil – a vigil for mourners who think they have inexplicably lost their country. “CAT-Scan The PSYCHOPATH” read a sign held up by a weather-beaten man of maybe 55, who happened to be white. And the teenage boys riding the Metro, from L’Enfant Plaza to the Shaw-Howard University stop on the Green Line, cursing and holding up middle fingers on both hands toward my iPhone camera, making a video my editors said was too profanity-laced to put up on the site. “Just shows you money can buy anything,” one said before he hitched his jeans up and the doors closed. Members of Howard University’s football team were among the students who had the day off. They played pickup basketball in the school’s gymnasium. One, Charles Robinson, a safety on this year’s Bison team, was resigned to giving Trump a chance. I had taken the Metro train from Silver Spring to L’Enfant Plaza early, then to Howard, and caught a cab to Ben’s Chili Bowl. I came back to the office and later walked five blocks to the protest, talking to people who came to “Make America Great Again,” and speaking with those who wanted to know exactly what they meant by that, people who believed deeply that things weren’t so bad to begin with, especially the last eight years. If they could have had their own hats made today for the occasion, they would have simply read: America Held Hostage, Day 1. 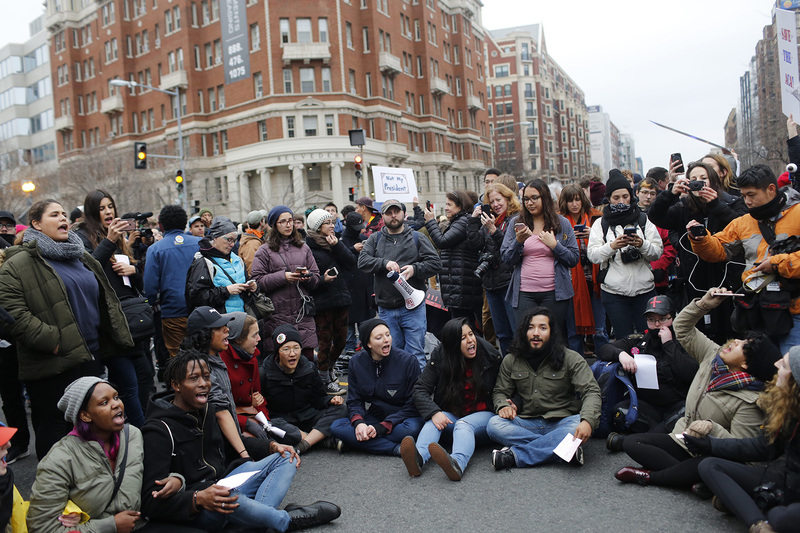 If there was a prevailing mood on the streets of Washington today – from black D.C. to gentrified D.C. to every tourist decked in red and others who had actually come to march for women Saturday – it was resignation, the notion that Donald J. Trump had found enough fed-up and angry Americans to have their way. 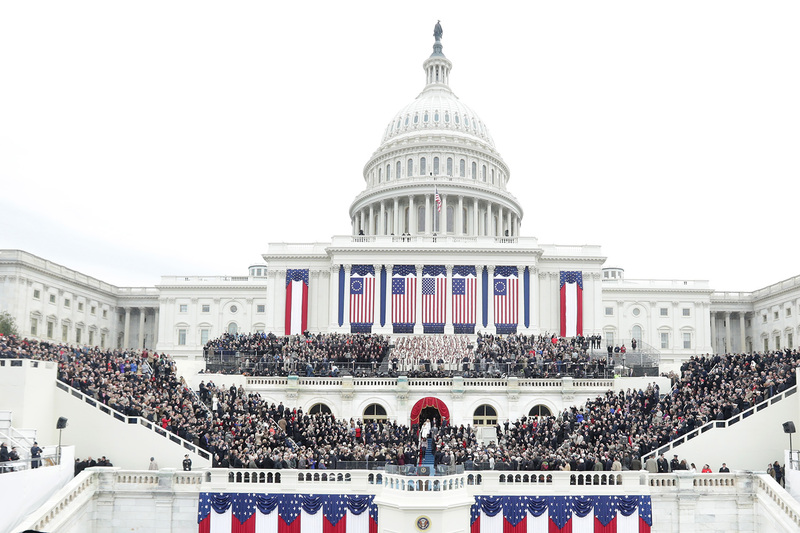 Having been here for the past three inaugurations, the crowds on the streets in different parts of the city felt much sparser to me, much less riveted by the proceedings – especially when contrasted with Obama’s historic 2009 election. Team Trump found their red-capped brethren, clapping and cheering mightily during the swearing-in portion of the day. And there were some heated and ugly confrontations, especially between protesters and police later in the afternoon. But on the whole, today in the District of Columbia felt like every other day in America recently – divided, partisan, neither side nowhere close to listening to each other with an open mind. And the most depressing part about it was, both sides seemed very comfortable with that arrangement. An anti-Trump protester tried to lend humor to the moment, dressing up as Vladimir Putin, replete with a Ivan Drago-accent from Rocky IV. But few laughed. The number of American flags draped over the shoulders of Trump supporters, sewed into the back of their jean jackets – Stars and Stripes everywhere – caught the eye of many anti-Trump people. 4:52 p.m. — It started with one man whisked away by police, his face flushed stop-sign red. Then it was another. Same face, same police presence. Five hundred feet ahead, at the corner of 12th and K streets, protesters and police in riot gear were getting up close and personal with one another. “Tear gas!” someone from the crowd yelled. Seconds later, another explosion. Then another. And one more. 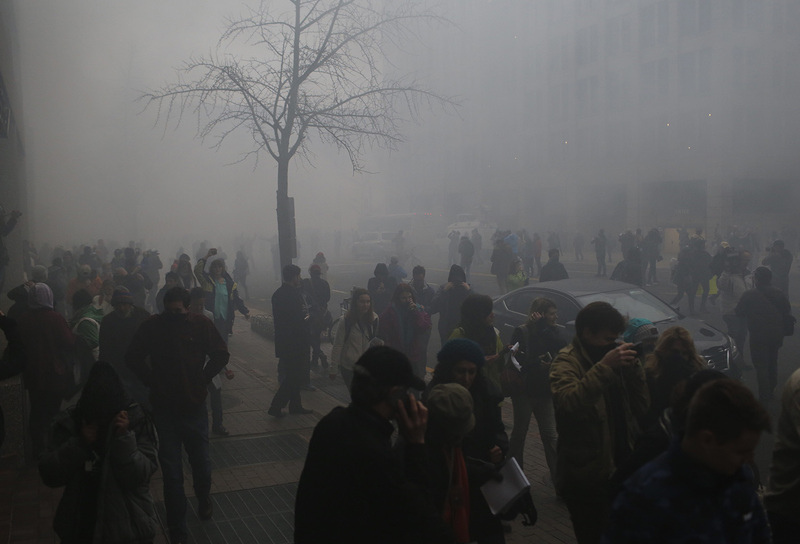 The blasts did little to deter the protesters from advancing as they hurled stones that bounced off law enforcement shields. 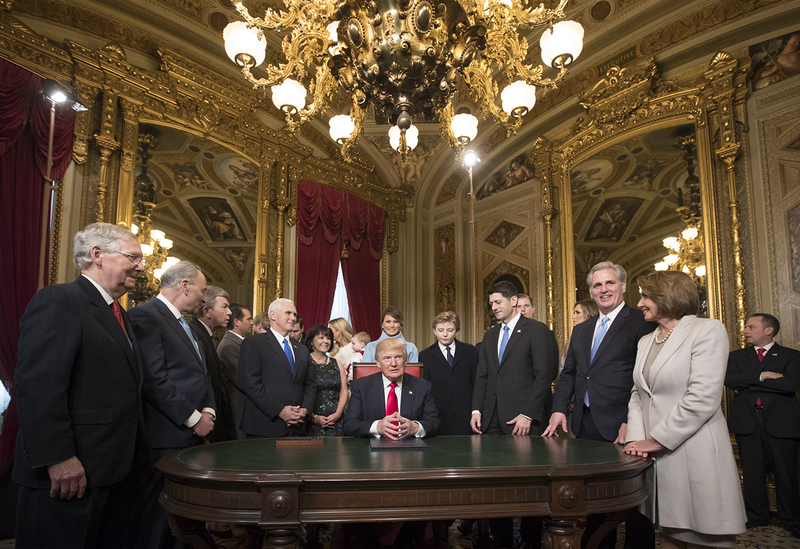 The back-and-forth between the two sides mimicked the board game Battleship. 3:16 p.m. — I’m here at Ben’s Chili Bowl, a Washington landmark, in the middle of U Street, in the middle of President Trump’s inauguration day. Bricks are being thrown on 12th and K, garbage cans are being set on fire less than a mile away as protesters engage with police. But here, the half-smokes sizzle on the grill and wait for the customers to smell the pork and the nitrates, inhale that steam coming from the burgers and dogs, and think of a world without President Barack Obama and, instead, Citizen Barack. There is no division, save the young man in the red tie with far more liberal friends sitting in back. Almost all voted for Hillary Clinton, and if they didn’t, they can’t believe their black president is gone – even the white diners. Clifford Ohrnberger, 27, from Brattleboro, Vermont, who works for World Learning, an educational organization, and Molly Cain, 24, from Seaford, Delaware, who works at a nonprofit in D.C. now, will take part in the Women’s March on Washington on Saturday. Ohrnberger went to a protest for marijuana legalization earlier. “We wanted to support a black-owned business,” Ohrnberger said. “We just felt like it was a more productive thing to do after the inauguration than light a garbage can on fire,” he added, as CNN showed ugly scenes with protesters in the background. 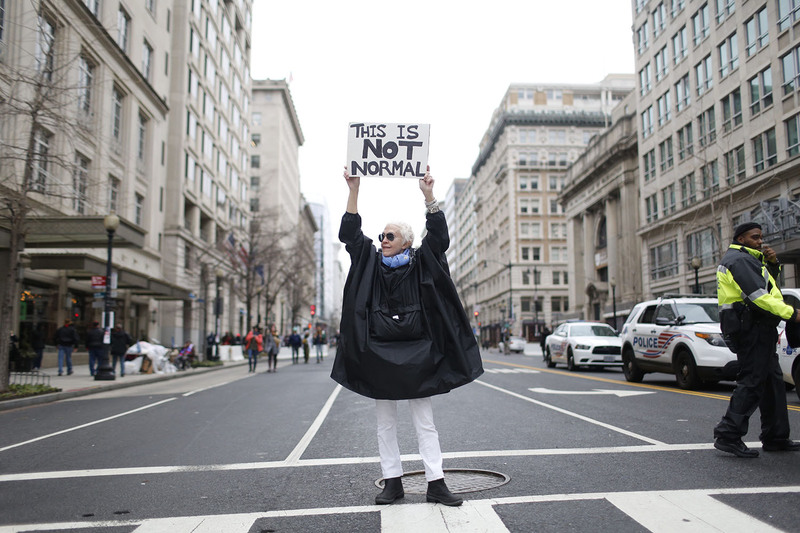 A protester stands in the middle of a usually busy downtown street in Washington, D.C.
1:11 p.m. — Moving away from Federal Center, the tension picks up almost instantly upon arriving at John Marshall Park, roughly a 12-minute walk from the National Mall. “Donald Trump, KKK? How many kids have you killed today?” greets supporters and protesters. In the crowd were attendees who had been at the park since earlier in the morning, and there was a face-to-face meeting between Black Lives Matter and Bikers For Trump. The showdown reportedly didn’t last long, with both sides being separated with no physical altercations. 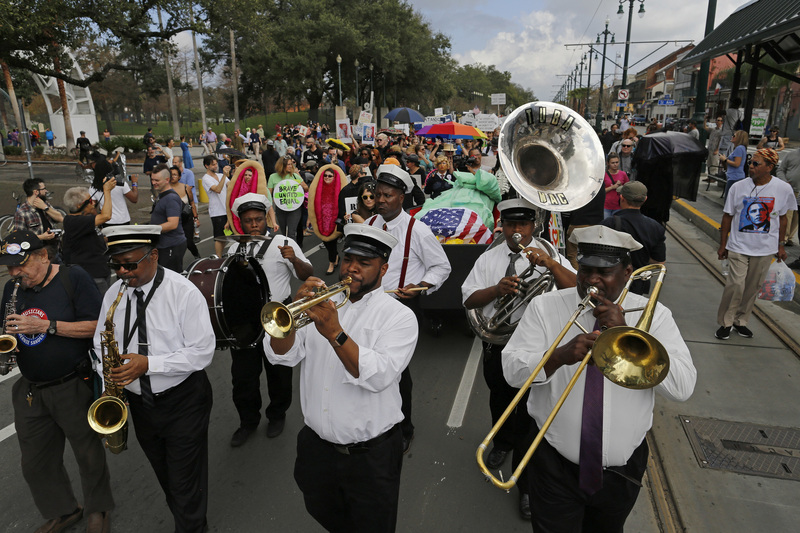 A block away on the corner of Sixth and Indiana, protesters blocked a street with chants directed to the new president, voicing frustrations on a litany of topics including Black Lives Matter, women’s rights and labor equality. As the crowd increased around them, so did participants who joined in. Perhaps the most surreal moment of the day thus far occurred outside D.C.’s famed W Hotel. 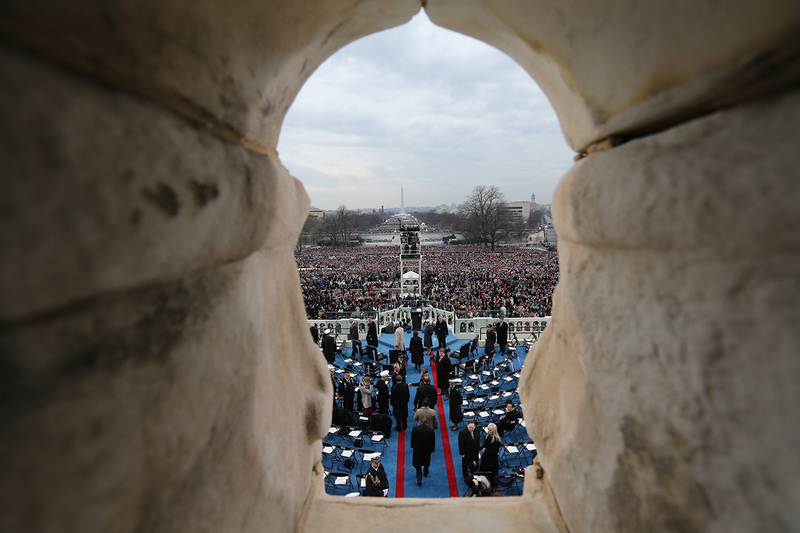 The Department of Treasury blocks the view of the inaugural ceremonies, but President Donald Trump’s voice billowed through loudspeakers and permeated the streets of D.C. that he will temporarily call home. Supporters stop and listen, captivated by the voice of the candidate they voted to lead America the next four years. It’s tough to decipher what Trump is saying, though the repeated roaring ovations from the crowd seem to suggest more of a rally than inaugural address. Other supporters light cigarettes. While Trump speaks and supporters attempt to listen intently, a heated debate erupts in the middle of 14th and F streets. The man is anti-abortion. The woman, pro-abortion rights. “A baby is not your body!” he yells. Today, there are just two Washingtons. There is, first, the Washington of a man or woman who knows deeply how wrong Donald Trump is for the nation and their own livelihood. They reside in places like Torrie’s on Georgia Avenue, a staple breakfast location across from Howard University Hospital, where most of the customers watch the inauguration, shaking their heads. His friends chimed in from neighboring booths as they poked at the fresh grits and home fries on their plates. “You think he could give his speech and then get pneumonia like that one president [William Henry Harrison] a couple months later?” James Stephens, an Uber driver in a fedora who looked to be 60 years old, said from his seat at the counter as the president spoke from the lectern. “Oh, no, you hearin’ everything in here today,” said L. Eady, the manager at Torrie’s, who asked that her first name not be used. A couple of moments later, she sat down, looked at the television and visage of the man with orange-blond hair in front of the microphone. “Lawd, have mercy,” she said. Second, there is the Washington of the red-clad visitors from the Rust Belt, Florida, Las Vegas, Southern Maryland and parts of America unknown. 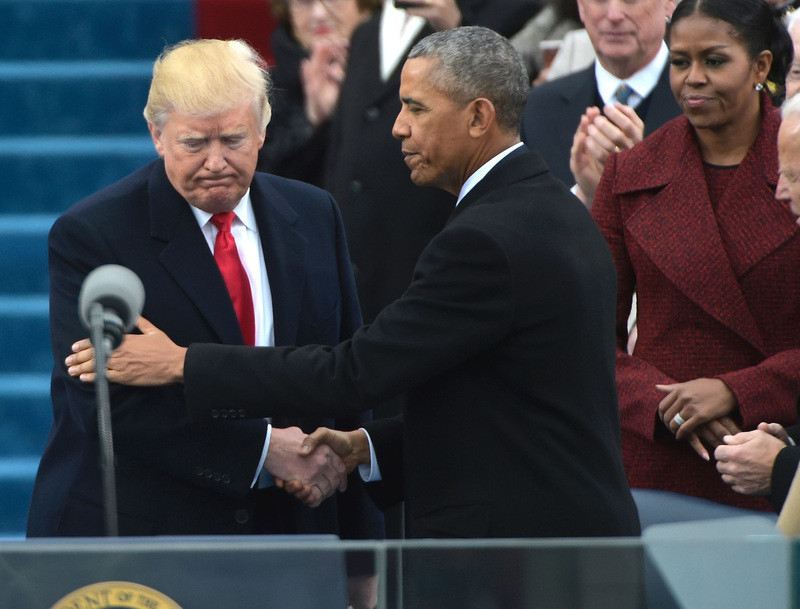 They come here for the elixir of hope they believe former President Barack Obama never provided them, and they’re hell-bent on celebrating the swearing-in of the man who openly mocked his opponents, women, Muslims, Hispanics and their values. By Saturday, it will be back to the old Washington again, and they all resemble high school cliques that segregate in their own professional enclaves: the political set, the nongovernmental organization and nonprofit crowd, the native District of Columbian who can tell you where Griffith Stadium used to stand, the journos and an assortment of transient college graduates figuring out their identities and careers. 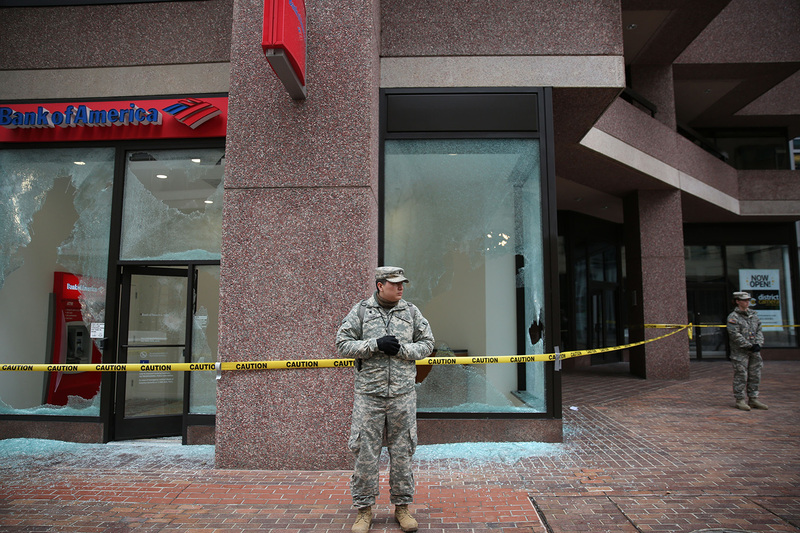 11:51 a.m. — Mark Johnson did a straight 14-hour shot, from Clearwater, Florida, to Silver Spring, Maryland, leaving at 1:30 p.m. Thursday and arriving at 3:33 a.m. 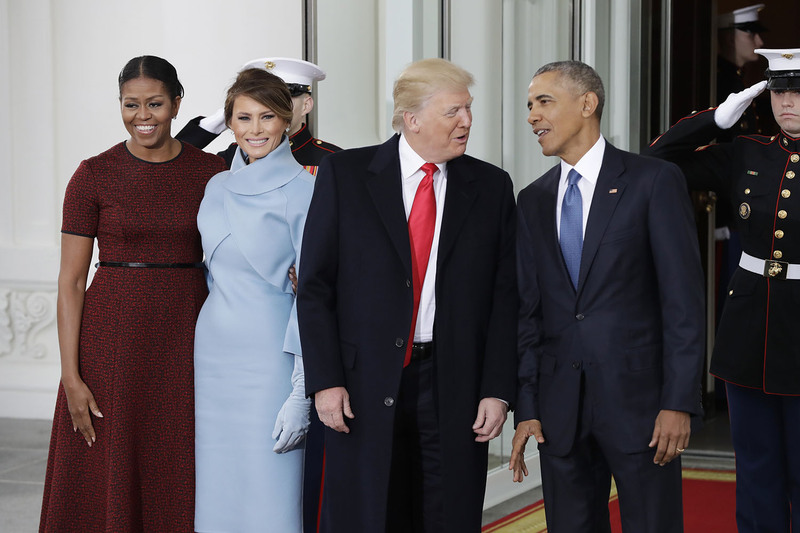 He was dressed in a red, heavy coat, a “Make America Great Again” red ball cap and had an official inauguration invitation in his pocket from Donald Trump and Mike Pence. He stayed at the home of Mary Drake, a personal friend. “All I did was write a letter at the end of December and the letter came in the mail a couple weeks later,” he said, sitting on a Red Line Metro train at the Forest Glen stop, headed toward the Capitol. He was surrounded mostly by commuters, who neither smiled nor paid him much attention. He laughed when he was told he essentially chose his candidate for president over his betrothed. When he got off the train to transfer to the L’Enfant Plaza Metro stop, he and a reporter encountered a slight, hard-featured Latino man on the platform, whom Johnson asked which train he should take. “No Ingles,” the man said. 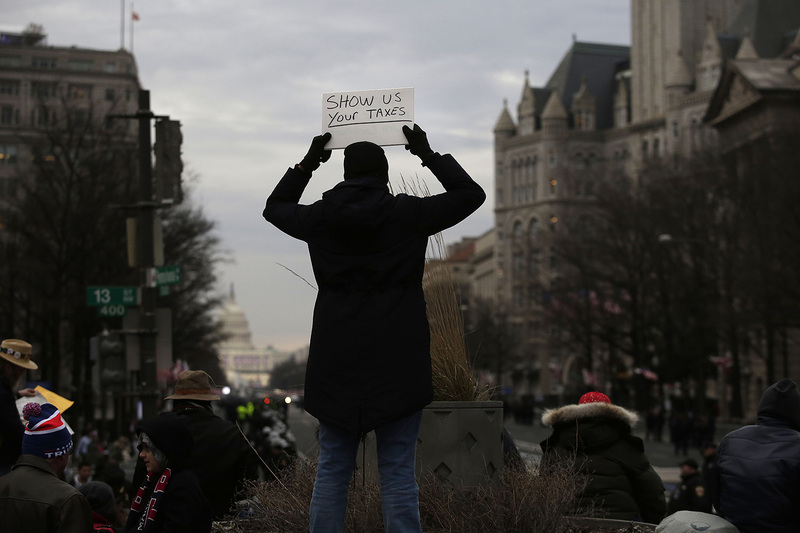 A person holds up a sign before the presidential inauguration of Donald Trump at Freedom Plaza on Jan. 20, in Washington, D.C.
9:32 a.m. — No sleep for the weary. No sleep for protesters, either. At the Van Dorn Street Metro station, even before daylight officially arrived, several protesters from Chicago awaited their trip into the nation’s capital. Protesters wearing T-shirts displaying “Look What The Russians Put In” — an obvious shot at the influence Russian president Vladimir Putin had on the 2016 election — and “Worst Swamp EVER” populated the waiting area. It’s on these early morning Metro rides, vastly less crowded at 8 a.m. than expected on the day of an inauguration, where tension is omnipresent. Protesters stand silently by supporters. Supporters, in every type of Trump-related gear imaginable, smile and talk quietly among themselves. However, it’s exiting the Federal Center SW Metro where the odds greatly shift into the pro-Trump favor. Thousands of supporters pour into the streets to wait in lines at the Silver and Orange gates entrances at the corner of Third and D streets. Trump USA beanies, pins, flags, scarfs and bucket hats paint the streets. Some young men even don their best Trump costume: blue blazer, oversize khakis and Make America Great Again hats. Vendors, much like at the Republican National Convention, are people of color, push popular Trump shirts and hats. One in particular sells “Obama bags.” He seems to have a problem pushing those, though one woman handed him $20. When he tried to give her a bag, she refused.